A debate raged throughout the twentieth century, and probably will continue, about the relative influences of heredity and experience on human behavior. Behavioral scientists today largely regard this "nature versus nurture" debate as an outmoded dichotomy. Most scientists now believe that behavior results from a combination of these influences, never entirely from one or the other. Clearly, genes significantly influence animal behavior. This is the only reasonable conclusion in cases where animals born and reared in isolation nevertheless develop age-appropriate, species-specific behaviors that they could not have possibly learned from other individuals. Such instincts that occur even in isolated animals include insect mating behavior; courtship, nesting, and brood-rearing behavior of pigeons; the songs of some (not all) birds; bird flight; and nut-cracking and nut-burying by squirrels. Animals are born "knowing" how to do certain things. Experiments that rule out social learning and trial-and-error learning leave heredity—that is, genes—as the only logical explanation for such behaviors. 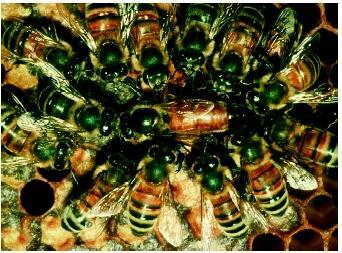 Experiments with honeybees have confirmed the relationship between genes and behaviors. selection can also shape the reactions of fruit flies ( Drosophila ) to light and gravity and the ability of rats to learn mazes. Such results would not be possible if genes did not influence behavior. The fact that X rays and chemicals can induce mutations that alter behavior strengthens the link to genetics. Mutations have changed obstacle-avoidance behavior of Paramecium and biological clocks and several behaviors in Drosophila. Breeding experiments confirm the relationship between genes and behaviors. For example, worker honeybees normally react to diseased or dead pupae by uncapping the honeycomb cell containing the pupa, dragging the pupa out, and removing it from the hive. This helps to prevent the spread of infections through the colony. Experiments in which normal honeybees were crossed with bees that do not bring out their dead traced the behavior to two genes: one that induces workers to uncap the diseased cell, and the other that induces the insects to remove the diseased pupa. Hybrids between behaviorally different strains and species of animals exhibit behaviors intermediate between those of the parents, or combine the parental behaviors. This has been seen for aggression in honeybees, courtship in Drosophila, breeding behaviors of cichlid fishes, food preferences in garter snakes, bird migratory and nesting behaviors, and bird distress calls. The foregoing observations and experiments, and many others like these, no longer leave room for doubt that genes significantly influence animal behavior. The subject becomes very controversial, however, when we come to the behavior of the most complex of animals, Homo sapiens. Behavioral geneticists find evidence of a genetic influence on schizophrenia, alcoholism, sleep disorders, depression, sexual orientation, intelligence quotient, and many personality traits. Consider, for example, sexual orientation, an intensely heated issue in which one side argues that people are born with a hereditary predisposition to become homosexual or heterosexual, and the other side argues that homosexuals simply "choose to be that way" and could change if they wanted to, or that this behavior was caused by childhood influences and can be "corrected" by such means as psychotherapy. J. M. Bailey and R. C. Pillard studied families with two or more male siblings, at least one of whom was homosexual. In 52 percent of the cases where the brothers were monozygotic (genetically identical) twins, the other brother was also homosexual; in 22 percent of dizygotic (nonidentical) twin pairs, the second brother was homosexual; and in only 9 percent of nontwin brothers, the second brother was homosexual. The 52 percent figure shows that genes do not inevitably determine sexual orientation; if they did, this figure would be 100 percent. But the contrast between this datum and the other two does suggest that heredity significantly increases the likelihood of a given adult sexual orientation. The sequencing of the human genome will provide a new tool to assess the genetic underpinnings of behaviors in the human species. A shortcut to sequencing the genomes of many people is to identify places in the genome where people tend to differ in the particular DNA base found. These sites are called single nucleotide polymorphisms, or SNPs, and already an international consortium of researchers has identified more than two million of them among the three billion bases of the human genome. Many research groups are now correlating specific SNP patterns to disease susceptibilities, and these include conditions that have behavioral components. One company, for example, is amassing SNP patterns among six hundred families in which two or more members have eating disorders. The researchers look at SNPs in genes known to be associated with eating behaviors and satiety, such as leptin and neuropeptide Y, and other, as yet unknown places in the genome where certain SNPs are statistically more common in people with these types of disorders. Even with this powerful new technology, it will be difficult to separate inherited tendencies from learned behaviors. Much of the opposition to the idea of a genetic influence on human behavior stems from political and social philosophies that are reluctant to accept the idea that not all human behavior can be shaped by experience or changed at will. It would be discouraging to think that tendencies toward war, racism, or marital infidelity were genetic and unchangeable. Hereditary theories of human behavior were taken to despicable extremes in the twentieth century, including a eugenics movement in America that argued that some races and classes of people were genetically inferior to others and, most horrendously, the racial philosophy of Nazi Germany, which extolled the fictitious "white Aryan race" while trying to systematically exterminate another. In light of this horrific history, it is understandable that some people recoil from any latter-day suggestions that human behavior is hereditary. Yet scientific evidence cannot be rejected simply because it does not conform to a political philosophy. In evaluating the influence of genes on human behavior, several points must be kept in mind. One is that behavioral geneticists are not arguing for genetic determinism: they are saying genes influence behavior, not that they rigidly determine it and destine people to behave in certain ways. Genes may influence human behavior, but they do not enslave people. All behaviors require at least some contribution from genes (to build sense organs, nervous systems, muscles, and the other equipment of behavior) and environment (to provide the raw materials to build this equipment and the experiences that sway gene expression ). As evolutionary theorist Richard Dawkins puts it, behavior is like a chocolate cake, needing both a recipe and ingredients. Genes provide the behavioral recipe, and the environment the ingredients. Finally, there is no such thing as a gene for any behavior. There is no aggression gene, no gay gene, no gene for bird song or nut-burying. Genes encode proteins , nothing more; but through proteins, they can influence behavior. Aggression and sexual behavior, for example, are influenced by testosterone, and testosterone is synthesized by enzymes , which are proteins encoded by deoxyribonucleic acid (DNA). Thus one can see how genes would influence these behaviors. All behavior, furthermore, depends on chemical signals (neurotransmitters) that are released by one neuron and bind to receptors on the next neuron. Neurotransmitters , too, are synthesized by enzymes encoded by DNA, and their receptors are proteins as well. Neurotransmitter levels control mood and probably aspects of personality. The list goes on and on. Indeed, it is impossible to see how genes could not play a role in behavior. Alcock, John. Animal Behavior, 7th ed. Sunderland, MA: Sinauer Associates, Inc., 2001. Bailey, J. M., and R. C. Pillard. "A Genetic Study of Male Sexual Orientation." Archives of General Psychiatry 48 (1991): 1089–1096. Clark, William R., and Michael Grunstein. Are We Hardwired? The Role of Genes in Human Behavior. New York: Oxford University Press, 2000. Lewis, Ricki. Human Genetics: Concepts and Applications, 4th ed. Dubuque, IA: McGraw-Hill Higher Education, 2001. Plomin, Robert, et al., eds. Behavioral Genetics, 4th ed. San Francisco: W. H. Freeman and Company, 2000. Wilson, Edward O. On Human Nature. Cambridge, MA: Harvard University Press, 1978. Russian biologist who won the 1904 Nobel Prize in physiology for his demonstration of the idea of a "conditioned reflex." Pavlov trained dogs to drool at the sound of a bell by feeding them immediately after sounding the bell. Austrian biologist who founded the study of animal behavior, or ethology. Lorenz said that animal behavior evolves in the same way as physical structures, such as wings. Lorenz shared the Nobel Prize in physiology with fellow ethologists Karl von Frisch and Nikolaas Tinbergen.